I am proud to announce two of Trading Volatility's achievements for the first quarter of 2016. First, our indicators put in a rather impressive performance to kick off the year. We also launched automated trading for our VRP+VXX Bias and VXX Bias algorithms via Collective2's world-class platform. The Trading Volatility indicators had a bit of a slow start in the first month of 2016 but rallied strong off of February's market low. 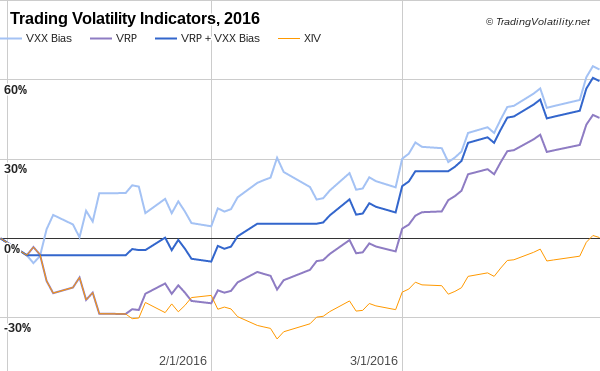 Our VRP+VXX Bias indicator finished at +59% for the first quarter of 2016, while our VXX Bias came in at +64%. Our VRP indicator finished the quarter at +46%. While I'm happy about the performance over the first quarter I'm even happier about the new option of auto-trading our indicators on Collective2's platform. As I announced a couple months ago, you can now have trades automatically placed in your brokerage account whenever the VRP+VXX Bias indicator changes. Since that post, we have added auto-trading for the VXX Bias indicator as well. Both strategies are available on Collective2 at an 85% discount for active Trading Volatility+ subscribers. I have previously written that the key to successful investing is to have a solid plan as well as the discipline to be able to execute against it. Having our indicators automated does exactly that. No more worrying about missing trades because I'm too busy. No more emotional barriers making me wonder if I'm making the right decision to buy or sell. No more distractions from the noise of daily market movements. No more being tied to a trading screen all day. Nothing changes for the existing Trading Volatility+ service. Subscribers will continue to have access to our intraday indicator data, receive emails with preliminary and final change alerts for each of the indicators as well as our daily summaries, and interact with our private community of volatility traders in the forum. If interested, you can learn more about our services on our Subscribe page.